You’d never believe that Mr Fox was once just a little sketch in the Scion designer’s studio in Leicestershire… now he is a household name in homes across the world. Mr Fox first appeared on bestselling fabrics and wallpapers before he made his way onto the Scion Living ceramics and homeware in 2012. 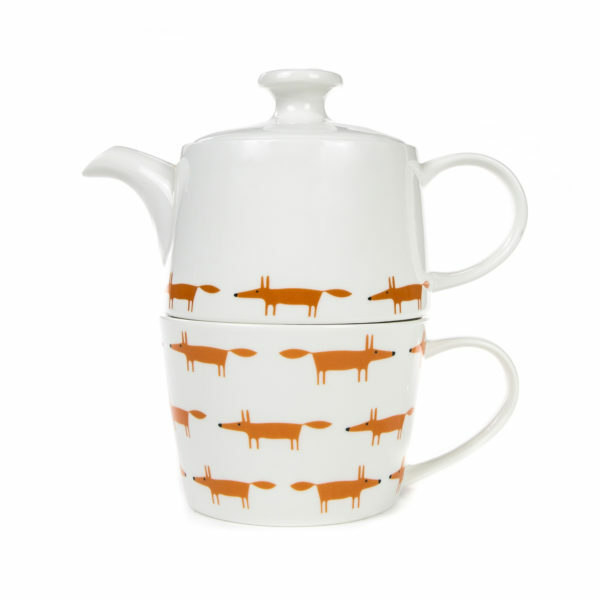 This Mr Fox tea for one set shows the iconic Mr Fox motif in its original punchy orange colour on a contrasting ceramic background. Designed collaboratively by skilled ceramicist, Keith Brymer Jones, and the Scion designers – using Keith’s knowledge of ceramic shape and the Scion designer’s expertise of contemporary design. Sometimes tea is just too good to share and this Mr Fox tea for one set has the added little luxury of a quirky embossed Mr Fox on the lid. An outstanding gift for any tea lover or if you are a tea lover then treat yourself. This tea for one set looks brilliant as a standalone set but amazing in amongst the other Mr Fox ceramics collection especially the matching Mr Fox storage jar and large jug. Add personality and colour to any home!